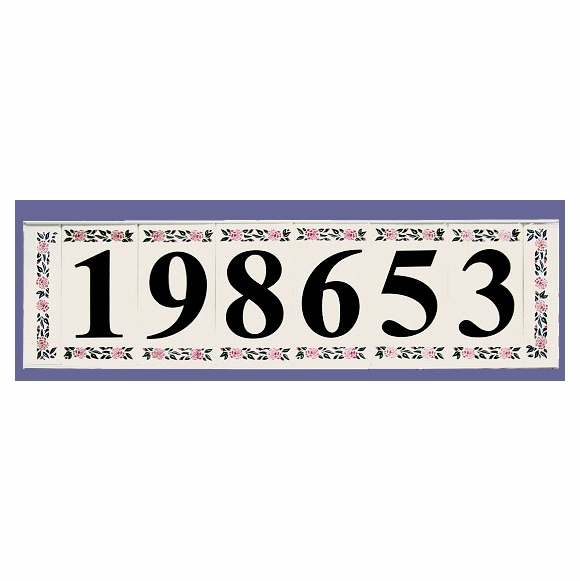 Floral Border Ceramic Tile House Number Sign - - holds six numbers. Custom made for you in the USA. Each number is contained on its own individual ceramic tile. Tiles are arranged on a nearly invisible slimline frame within a border of flowers. Dimensions (approximate): 21"W x 6"H.
Ceramic tile with a number is approximately 3" x 6"; each border tile is half-size or about 1.5" x 6". How does this item mount to my house? A: There are 4 recessed holes that allow for wood screws to pass through into plastic anchors. The tiles are then slid in from either end. All hardware is included.